Reservations for the Lake O’Hara bus remain similar to 2017, and while it’s not necessarily new, the speed in which bus reservations fill for the entire season makes it imperative to read the webpage: Lake O’Hara Bus Schedule 2018. Parks Canada has greatly expanded content on their website www.pc.gc.ca and it is now much easier to find information on each park and its attractions. Also of note is a page designed to make finding parking easier and alerting visitors to demand at the most popular places within Banff National Park. It’s at: http://pc.gc.ca/banffnow. 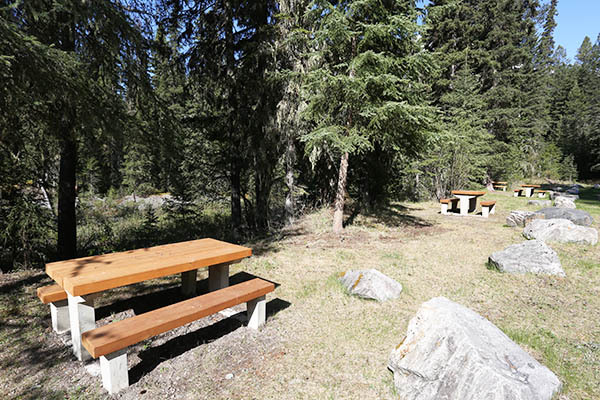 The day use areas in Kootenay National Park have been long overdue for major upgrades, and this finally took place at most sites through 2017, with the replacement of picnic tables and upgraded washrooms. The new picnic tables at Wardle Creek Day Use Area. Twinning of the Trans-Canada Highway continues through 2017, with crews working on the west side of the Continental Divide near Wapta Lake. 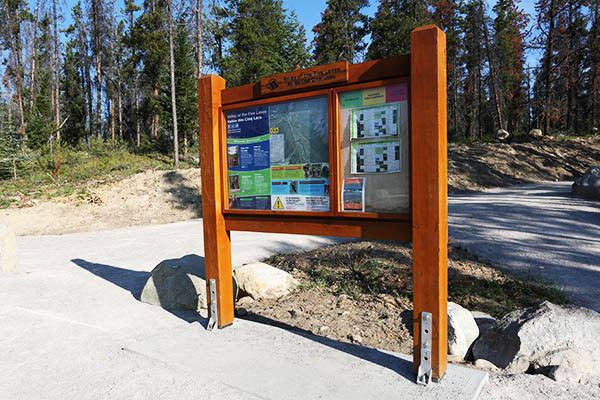 Although officially completed in late 2016, the new and expanded parking lot for the Valley of the Five Lakes Trail in Jasper National Park is much needed for the 2017 and future hiking seasons, and includes new signage (below). New signage at the revamped Valley of the Five Lakes trailhead. To help make finding a parking stall easier, the town of Banff has established the website http://www.banffparking.ca with a live feed to downtown park stall occupancy. RVs are given special consideration, with availability for these vehicles on a separate page. 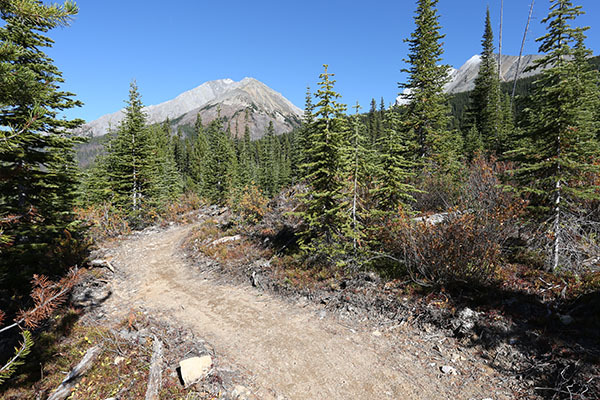 The 80-kilometre High Rockies Trail between Goat Creek to Elk Pass, 80 kilometres in length, has been completed. Primarily designed for mountain bikes, it can be completed in sections and is linked to The Great Trail (www.thegreattrail.ca), formerly known as the Trans-Canada Trail. The newly completed High Rockies Trail near Runnel Lake. Brewster has tried a couple of different concepts at the prime Banff Avenue location of their Elk + Avenue hotel, and the latest is a Good Earth Coffeehouse (333 Banff Ave., 403/985-0989, daily 7am-8pm), part of a 40-strong chain that originated in Calgary in 1991. The Magpie & Stump has been part of the Banff dining scene for decades. It’s menu was completely reworked a couple of years back, but the big news this year is a new rooftop patio, complete with its own bar and kitchen. Construction of the wildlife fence along Highway 93 through Kootenay National Park continues this summer. The fence is being erected along stretches of highway that have historically recorded high animal mortality rates. 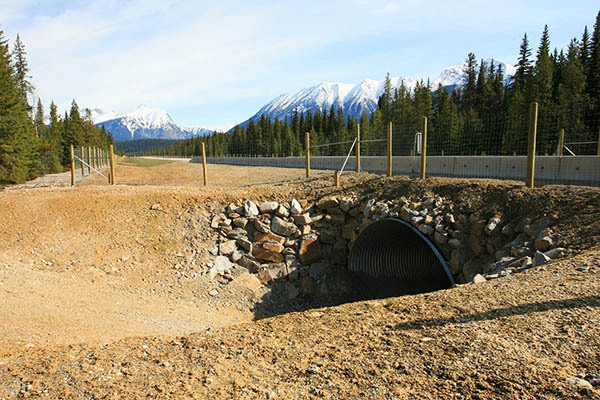 The newly built animal fence and underpass along Highway 93. The 176-room Moose Hotel & Suites opened in late spring. We’ve been photographing progress for the owners since before demolition of the older buildings on the site began in 2014, and will posts a montage upon completion. Banff’s newest hotel is the Moose Hotel & Suites on Banff Avenue. The International Hotel on Banff Avenue has been rebranded as the Elk + Avenue. 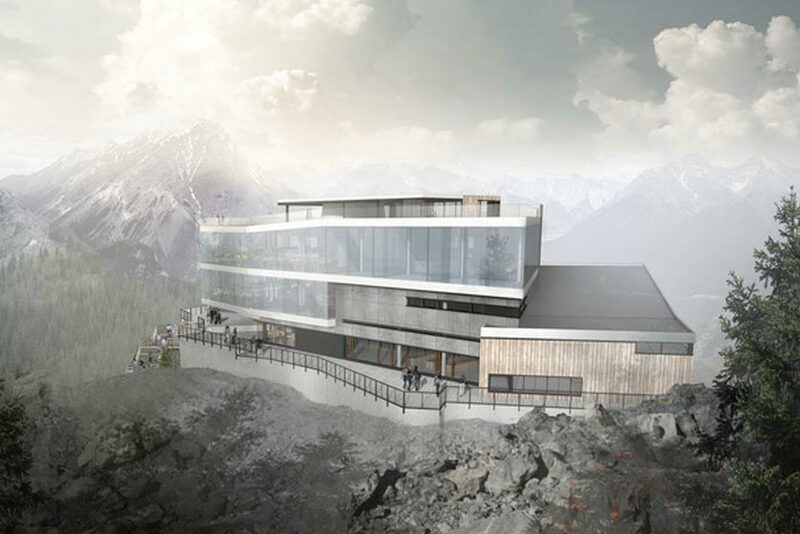 The Banff Gondola will be closed until 1 May 2016 to facilitate construction of a new Upper Terminal. The gondola will commence operation in May, with the opening of the Upper Terminal building slated for August 1, 2016. Keep track of the project here. Below is an artist’s impression of the redevelopment (courtesy Brewster). As of February 2016, the Banff Cake Co has been renamed Banff National Perk. It still offers some of the best coffee in town at reasonable prices. Downstairs in Banff’s Clocktower Mall, what was once Aurora Nightclub has been transformed into High Rollers (110 Banff Ave., 403 760 5300, daily 11:30 am-2am), which opened on 20 February, 2016. It is anchored by an upscale bowling alley with six lanes and two bocce courts, but is also notable for 48 beers on tap and a menu or gourmet pizzas. The former space occupied by Le Beaujolais has been given a modern renovation and is now Chuck’s (101 Banff Ave., 403/762-4825, daily 5-10pm), an upscale steakhouse that takes full advantage of its second floor location with views extending across Central Park to Sulphur Mountain. In Jasper, Wicked Cup (912 Connaught Dr., 780/852-1942, daily 7am-5pm) opened outside of downtown in the Mount Robson Inn, but it’s quickly become popular for its sunny patio, top-notch coffee, and tasty breakfasts and lunches. 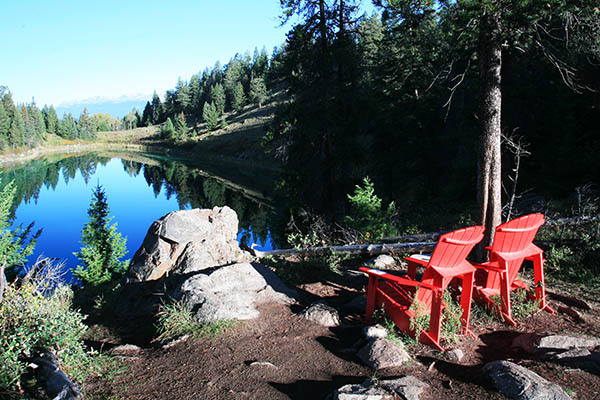 For daytrippers, the process for booking a seat on the bus to Lake O’Hara has changed for 2015. Rather than reserving up to three months in advance, bookings for th entire season open on 20 April 2015. The three-month rule remains unchanged for campers. We describe the process more fully here https://thecanadianrockies.com/lake-ohara-bus-schedule-2015. 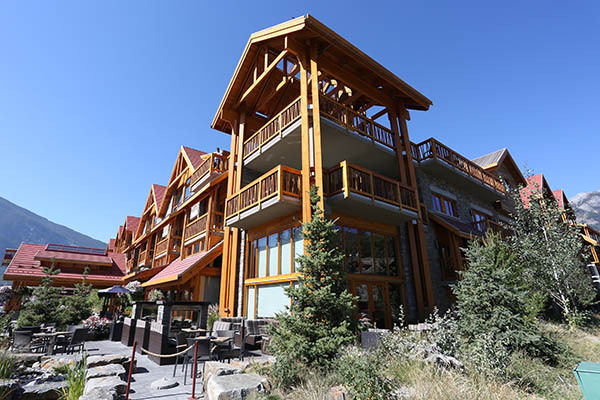 Along Jasper’s main street, the old Amethyst Lodge is now Crimson Jasper, with a funky exterior and completely revamped interior that includes 99 modern guest rooms and a contemporary restaurant. For the last few years, the southern half of the Bow Valley Parkway as far north as Johnston Canyon Campground has had a voluntary springtime restriction on travel between dusk and dawn to help protect critical wildlife habitat (most notably wolves and grizzly bears). But being voluntary, the closure wasn’t well observed, and so this year, the closure became mandatory, complete with gates at both ends of the 17-kilometre stretch of road affected. The closure is in place between March 1 and June 25 between 8 p.m. and 8 a.m.
Red Chairs along the Valley of the Five Lakes Trail. 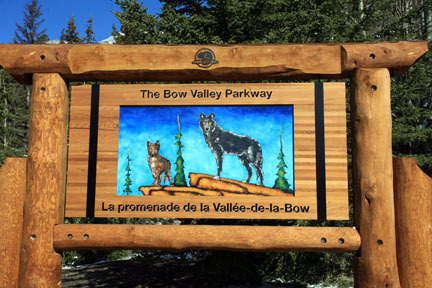 On 7 May, Parks Canada erected beautiful log welcome signs at the north and south end of the Bow Valley Parkway featuring wolves (south end; see below) and a grizzly bear (north end). The first big new commercial attraction to open for many years in the Canadian Rockies is the Glacier Skywalk, which opened in early May 2014. It is along the Icefields Parkway in Jasper National Park, just north of the Columbia Icefield. We were lucky enough to experience the Skywalk upon completion late last fall and were impressed by the structure and the unique perspective it gives, hanging 280 meters (918 feet) above the valley floor. For details, visit our Jasper National Park Scenic Drives page or contact Brewster (403-762-6700, www.glacierskywalk.ca). The licensee for canoe rentals on the Bow River has changed. The location is the same—within walking distance of Banff Avenue at the west end of Wolf Street—but the name has changed. Banff Canoe Club is open daily from May to September, 10 a.m. to 6 p.m. and can be contacted at (403) 762-4554 or www.banffcanoeclub.com. In addition to canoes, the concession also rents stand-up paddleboards (the only place to do so in Banff National Park). Livingstone Golf Course, a nine-hole layout off the Trans-Canada Highway near the entrance to the Sibbald region of Kananaskis Country, opened this spring. It’s par 36 and plays to 3,170 yards from the back tees. For reservations, call (403) 932-4414. Tavern 1883 has opened in the space previously occupied by Zona’s, which was a Canmore institution for almost 20 years. Originally an early 1900s residence, the space has been extensive renovated and opened up, with a single dining room centred on a large bar and decorated in a mountain-rustic theme with lots of exposed wood. The large patio out front remains in place. The Tavern 1883 menu uses lots of local ingredients and offers something for all tastes and budgets, ranging from a quinoa burger to AAA Alberta beef tenderloin. Tavern 1883 is at 709 9th Street, tel. 403/609-2000, and is open 11:30 a.m. to 10 p.m. Mon. to Wed., 11:30 a.m. to 2 a.m. Thurs. to Fri., 9 a.m. to 2 a.m. Sat. to Sun. Opening at the very end of 2013, Whitebark Cafe gives Banff locals and visitors alike an excellent alternative to the downtown cafes, although it’s just a five-minute walk from the heart of town. The coffee poured is as good as anywhere in Banff and teas are sourced from the locally owned Banff Tea Company. Whitebark Cafe is at 401 Banff Avenue, 403/760-7298, and is open 6:30 a.m. to 5:30 p.m. daily. In June 2013, flooding affected the lone secondhand bookstore in the Canadian Rockies, Canmore’s Second Story Books, which never reopened. Two blocks down Canmore’s main street, Joy Mclean at Cafe Books decided there was still a market and in April 2014 expanded her store to include an adjacent retail space dedicated to secondhand books. Rather than filling the space with all manner of books, she displays a thoughtful collection of titles, with the emphasis on local non-fiction. Cafe Books (826 Main St., 403/678-0908) is open daily 9:30 a.m. to 8 p.m.